Acromegaly is a disease which happens as a result of excessive secretion of a growth harmone called somatotropin. It is also called hypersomatotropism. This dog disease results in enlargement of the head, face, hands and feets. In man and the cat the overproduction of the growth hormone results sue to GH-producing tumor of the pituitary gland. However, in dogs the reason is different and the disorder is reversible. In dogs acromegaly may be due to progesterone secretion. Use of medicines containing progesterone can cause an excessive hormone growth. This dog disease may be cured by spaying. 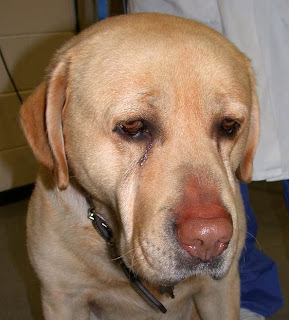 This dog disease may be diagnosed by counting the increased plasma growth hormone of insulin-line growth factor 1 concentrations if the above mentioned symptoms are noticed. Progestagen withdrawal and ovariohysterectomy are the procedure which may cure this disease by reducing the plasma GH and GH-dependent insulin-like growth factor concentrations.